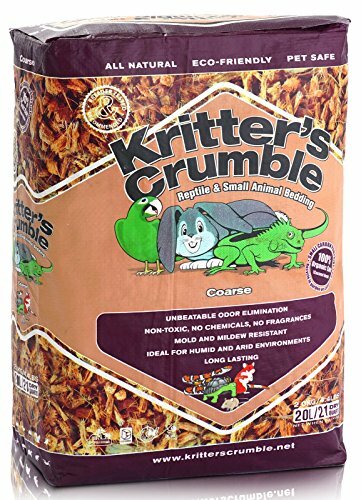 Kritter’s Crumble All Natural Coconut Husk Fiber Reptile Substrate and Small Animal Bedding is super absorbent with amazing, unbeatable odor elimination. Made of coconut husk (coir), a 100 percent organic, renewable and sustainable resource, Kritter’s Crumble contains no oils, fragrances, chemicals, or anything harmful. It is pet safe and has a soft, earth-like texture that pets instinctually prefer. Kritter’s Crumble is naturally structured of millions of leach resistant micro-sponges that absorb moisture and trap odors, holding more than four times its weight in liquid, ideal for arid or humid environments. Used Kritter’s Crumble (with reptile solids removed) is a valuable resource with the properties of a peat moss and serves as an excellent soil conditioner, compost additive, or may be placed in the green waste bin for municipal recycling; the presence of small animal and bird droppings creates an organic fertilizer! Kritter’s Crumble has a small carbon footprint (paw print) – it involves no cutting down trees, no mining the earth, and no crop production, which are all significant greenhouse gas contributors. Excellent for use with all small animals, reptiles, amphibians, arthropods, arachnids and bird cages. View More In Reptiles & Amphibians. If you have any questions about this product by Kitty Crumble, contact us by completing and submitting the form below. If you are looking for a specif part number, please include it with your message.